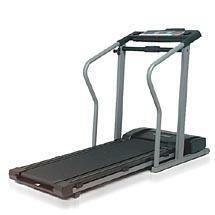 The Image 14.0 treadmill is another one of those treadmills that comes with a huge tread belt but a small motor. This simply means that the treadmill won’t be useful for very long since the motor isn’t powerful enough to run the machine. Because of its poor quality, I don’t think this treadmill should be used for running. So unless you’re just looking for a treadmill to walk on, I don’t suggest you buy this machine. Also, people who buy Image treadmills are usually those who are on a tight budget. These treadmills are made from cheap parts so don’t expect them to be of good quality. If you have the money to spare, don’t settle for this brand. You’ll be better off buying a mid-priced treadmill. But if all you can afford is a machine below $1,000, then I recommended the Smooth 5.15P. It is currently our best buy entry level treadmill. Like most Image models, the Image 14.0 treadmill offers a 2.5HP motor (not continuous duty) which reaches speeds of up to 10 mph and is inclinable for up to 10%. These features allow you to modify the intensity of your workouts to suit your fitness level. The 55"L x 18"W treadbelt is pretty big considering the fact that this is a budget treadmill. But like I’ve said above, I don’t think the motor is powerful enough to handle the treadmill because the bigger the treadbelt, the bigger the motor is needed to run it. The Image 14.0 also presents a variety of 6 pre-programmed, 2 user defined, and 2 pulse driven workout profiles. Plus it is iFIT compatible so your program choices doesn't end with this machine's built-in workouts. This treadmill is also equipped with a comfort cell cushioning, which reduces harmful impact that causes injuries, and an Easy pulse grip sensor, which tracks your pulse and enables you to workout in your target heart rate zone and burn more fats. As with most Image treadmills, this one also lacks the quality. Add to this the fact that it has a small motor and a short (90 days) warranty, and you'll be spending more than expected in order to repair and maintain this machine. I don’t recommend the Image 14.0 treadmill for its poor quality. This treadmill won't be useful for a long time. If you plan to buy one, be sure to put aside some money for repair and replacement costs. If after reading this review you still plan on buying an Image 14.0 treadmill, I suggest you buy it at Walmart for $548.62.